RGB strips come in lots of different shapes and sizes. 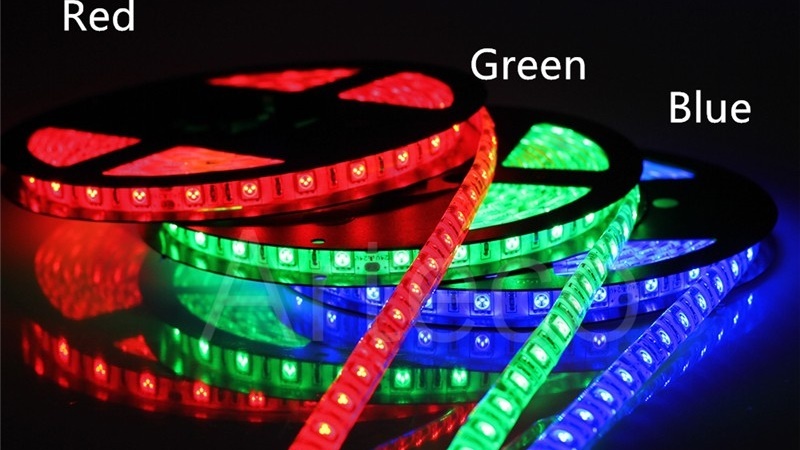 Most strips use a 5050 LED package (5mmx5mm) with 3 colors inside of them. This means that each little LED module has a tiny LED in it for each color. Since what you are trying to light is always “far away” from the strip, these three colors blend together to form a single color. Next it’s important to determine how many LEDs per meter you want to have. Higher density strips often look better because of a more uniform view instead of seeing all the LEDs individually. Analog RGB LED strip can only change color for the whole strip, if you want to control the color of each individual LED take a look at Digital LED strips. The main advantage of analog LED strips is that they are much cheaper then digital LED strip and work perfectly for lighting a room or a wall. 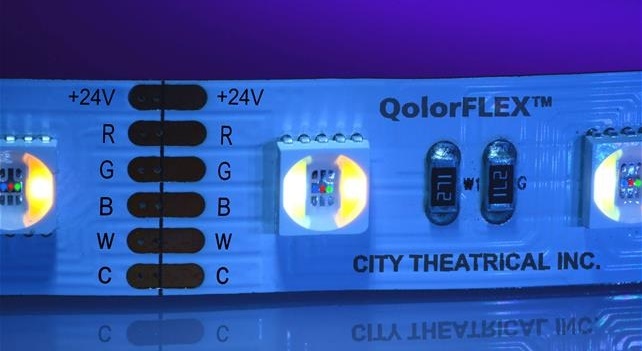 QuinLED-Quad has 4 dimming channels and can natively control an RGB strip with all channels active at the same time! You get one spare channel with which you could hook up a separate Color (Warm White for instance) strip! 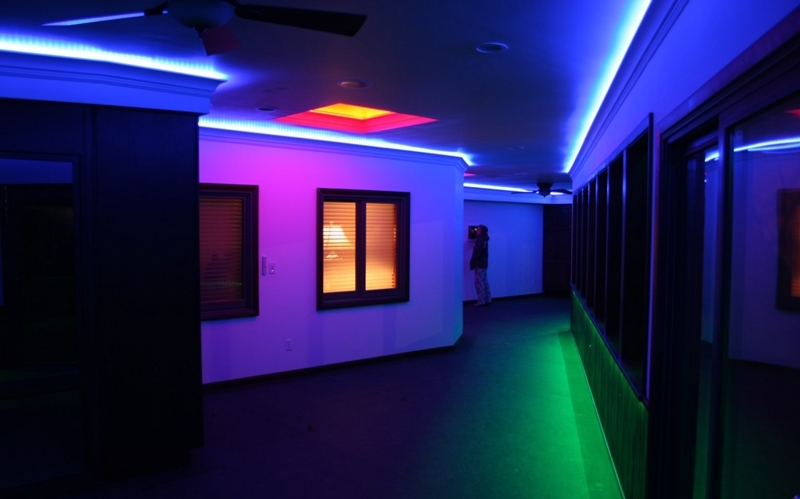 QuinLED-Deca has 10 dimming channels and can natively control 3 RGB strips at the same time! RGB by itself can produce a deep Red, Green or Blue color, all other colors are blended as explained above. This has some disadvantages especially when trying to create white light. All though in theory white light is all the different spectrums blended together, in reality, white light produced from three colored light sources just doesn’t look that great. Even with the 3 separate color LEDs so close together you still get weird shadows and an impure color. Often white light produced from LED strips is a bit purplish in color. The solution to that problem is adding a white LED in the mix. Whenever a pure white color is requested the white LED will for fill this purpose creating nice and correct white LED light. This makes the strip suitable for normal lighting (where white light is mostly preferred) and when wanted the same strip can also do some accent lighting in different colors! If you’re controller is intelligent enough (depends on the domotica software) you can even use RGB + W LEDs to blend together and create nice looking pastel colors, impossible without the white LED! 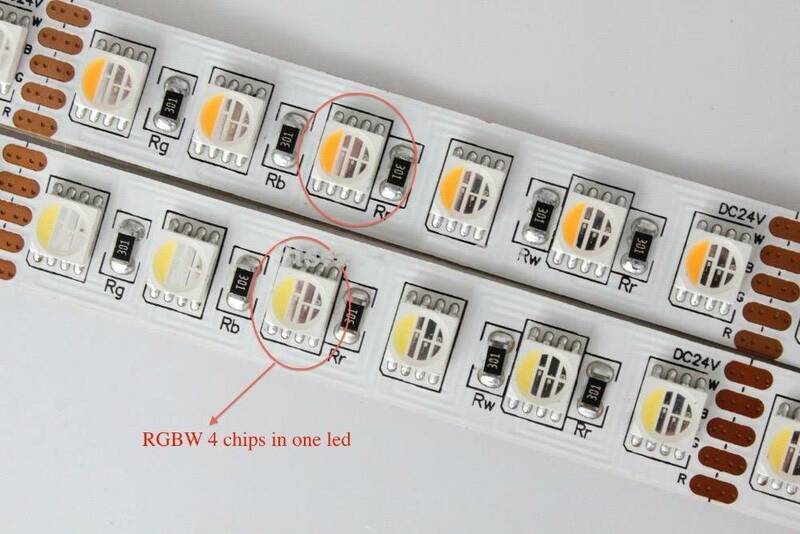 RGBW strips can often be purchased with either RGB+Warm White or RGB+Cold White. Also there is variants where they have 4 tiny LEDs in side of the 5050 package or where they have separate 5050 RGB and white LEDs on the strip! Choose a strip with a lot of LEDs to have the best light coverage. Also keep in mind that a strip that combines all these different LEDs on one strip can never give off as much light as a strip that has one function! QuinLED-Quad has 4 dimming channels and can natively control an RGBW strip with all channels active at the same time! QuinLED-Deca has 10 dimming channels and can natively control 2,5 RGBW strips at the same time! Depending on the Domotica software used you can use 2 QuinLED-Deca’s to control 5 RGBW strips at the same time! RGB + WW + CW? But even RGBW wasn’t enough for some people! Next to Red, Green, Blue and White they also want to be able to change the strip between cold white and warm white, creating a truly universal light source. These strips are available using a few different names such as RGBWW or RGBWWCW, it depends on the vendor what is what. Most often these strips are made with separate RGB 5050 LED modules + warm white + cold white separate LED modules on the strip there are however strips that do used combined modules! As mentioned above, a strip with more LEDs will give off more and more even light but because there is 5 channels on the strip it will not be as bright as a single color strip! QuinLED-Deca has 10 dimming channels and can natively control 2 RGBWW+CW strips at the same time! Although this article is called RGB if you only want to have a single color, it’s best to use a strip that can only display that one color, just like a white strip does for instance. Single color strips are cheaper and provide a lot more light in that color then multi-color RGB strips. If you are looking at using any of the above kind of strip for primary lighting, take a look at my articles about the color white and CRI/Ra! Sadly I haven’t found a RGB(WW)(CW) strip which combines high quality color RGB with high quality white light. Myself I most often use both an RGB strip + a white LED strip. Depending on the QuinLED module used this can be done on the same module for one or more sets of strips! When selecting LED strip, also make sure to have read my article about 12v vs 24v LED strip or Voltage Drop! Especially for longer runs of LED strip (more then 2 meters) it can make a big difference!